Q. How do I know Fuller has access to an eBook? The Fuller library catalog (WorldCat) searches many other library catalogs beyond Fuller. 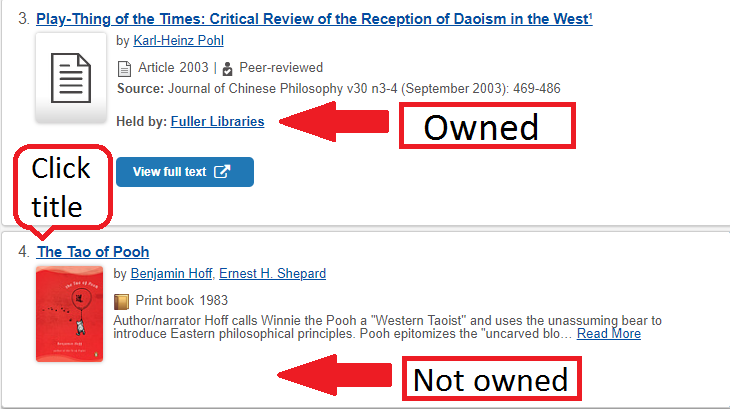 This is useful for requesting interlibrary loans and learning about resources available beyond Fuller, but it also sometimes generates search results that are not immediately available to Fuller students. This also applies to e-resources. The other major visual cue is the blue button which will state "view full text" for electronic articles and "view eBook" for eBooks. If you click the item's title, you will see all the databases that provide access to the digital text under "availability." The "View eBook" button defaults to the first listed database. If you encounter a broken link, try accessing the title through a different listed database. Click "report a broken link" for those that do not work properly (see photo below). You can also notify the electronic resources department at lib-systems@fuller.edu if you are having any electronic access issues. Conduct a search of your desired subject or title in the library catalog. 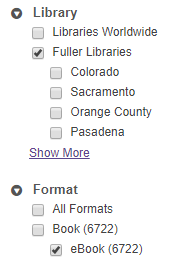 In the left "search tools" column, select the "Fuller Libraries" facet under "availability." 4. Your results will now be limited to only Fuller owned eBooks!